Harley’s on vacation (as we learn via flashback), and left Coach in charge back home on Coney Island (as we learn in a further flashback), only to be interrupted by the Furies from Apokolips, who have been sent by Granny Goodness to recruit her. If there’s any doubt as to impact the Warner Animated Universe has had on me and many other comic fans, when I read Harley, I hear Arleen Sorkin. When I read Granny Goodness, I hear Ed Asner (no, really). Why Granny wants Harley above all others isn’t clear; maybe she’s low hanging fruit, because HQ is PDQ to accept her role as one of the Furies. She gets to fly around Apokolips, busting heads until summoned by GG. Not, THAT’S a vacation. The artwork by Timms is as exemplary as ever, a comforting return to the Harley we know and love. 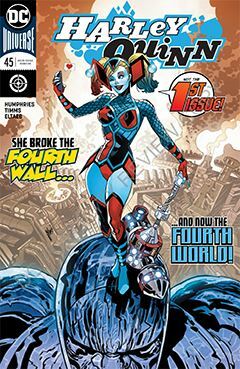 While placing her on Apokolips may seem a bit of a stretch, leave us not forget this is HARLEY-FREAKIN’-QUINN we’re dealing with her. If you want something that makes sense, put down that comic book and pick up Joseph Heller’s Catch-22. I’ve always wondered how non-powered characters (Harley, Batman, Green Arrow) manage to traverse the lethal terrain of Apokolips. But again, it’s comic books. Some things are better left alone. But Harley’s vacation isn’t over yet, so there’s more to come.